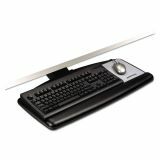 3M Knob Adjust Keyboard Tray With Standard Platform, 25 1/5w x 12d, Black - Knob Adjust Keyboard Tray features a basic knob adjust arm that controls both height and tilt. 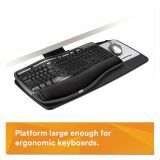 Gel wrist rest has antimicrobial protection that inhibits the growth of microorganisms, such as bacteria. Keyboard tray has a tilt range of +10/-15 degrees, 360-degree swivel and unlimited positions within height range. 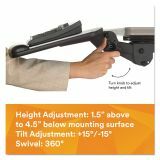 Height adjusts 1-1/2 above worksurface and 4-1/2" below worksurface. 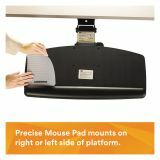 Mouse surface can mount left or right. Keyboard tray is designed for standard workstations that can accept a 17-3/4" track. 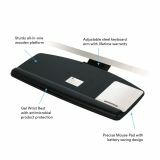 Tray is made with a high percentage of recycled material."